Chris Davis singled home two runs in the top of the twelfth inning to lift the Orioles past the Red Sox 5-3 at Fenway Park. The loss was the second in a row for the Red Sox who still saw their magic number to make the playoffs drop to one thanks to the Royals beating Cleveland. A win against the Orioles in the series finale Thursday night would clinch at least a Wild Card spot. 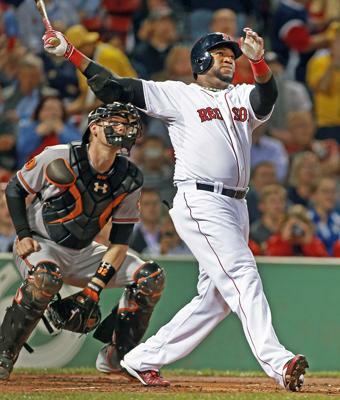 David Ortiz (pictured) put the Red Sox on the scoreboard in the bottom of the first inning with his twenty eighth home run of the season. It came off Baltimore starter Wei-Yin Chen with Shane Victorino aboard. The Orioles tied the game with two in the fifth and took a 3-2 lead with a run in the sixth. Mike Napoli got the Red Sox even in the bottom of the sixth with a solo home run off Chen. Jake Peavy started for Boston, going seven innings charged with three runs on six hits and a walk. He struck out eight.